Fat, Sugar, and Gluten. These 3 ingredients are what most consumers are avoiding these days when it comes to food. It comes to a point that fat-free, sugar-free, and gluten-free has become the selling point for most food products. But without these, what do food manufacturers replace them with to maintain the same texture and taste consistency of the food product with the real thing? C&EN Senior Business Editor, Melody Bombgardner, explains that manufacturers face the problem of recreating the texture or "mouth feel" of food products that have cut back or reduced fat, sugar and gluten content. Because of consumer demand, more of these type of products are being sold. Replacing these components with alternatives without using complicated lists of ingredients with the names of hard to pronounce chemical compounds is what food companies are having problems with these days. In her article, Bombgardner describes how other natural ingredients, are assuming increasingly important roles in giving those processed foods a satisfying taste. A mouth map is used to help formulate "light" foods so that the taste is comparable to the full-fat versions. The article also features one sidebar on natural food ingredients used to give processed foods a satisfying texture and another on food ingredients that do double-duty as ingredients in toothpastes, shampoo, skin creams, and even oil and gas drilling. 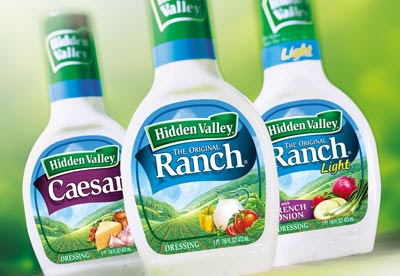 An example used is Hidden Valley Ranch Salad Dressing. The light version of the product has 40% fewer calories and 50% less fat than the regular dressing. The slogan on the bottle even says, “Betcha can’t tell it’s light!” The reason for this is because the ingredients include modified food starch, carrageenan, and xanthan gum, rather than oil and sour cream. What food processors are avoiding is the negative reaction in using chemically altered food substitutes. With this, Ingredient suppliers are playing a big role in helping customers balance health claims, good taste, and consumers’ desire for “natural” foods. There are two major categories in textural replacement, hydrocolloids and carrageenan and alginates. Hydrocolloids hold on to and control the migration of water in foods and beverages. Two most popular ingredients from this category are starches and gelatin. Carrageenan and alginates are from seaweed; cellulose, derived from tree pulp and cotton; other plant-derived substances such as pectin and guar gum; and xanthan gum from bacterial fermentation. Seisun estimates that 1.4 million tons of hydrocolloids was consumed worldwide in 2010. Of that amount, 73% was starch. Asia in general, and China in particular, is a growing market for hydrocolloids. The global market for hydrocolloids used in food was worth US$5.8 billion in 2010. There are new alternatives to food ingredients that are fast becoming popular. All of them are trying to replicate the taste and texture of the original product without the presence of fat, sugar, and gluten. But with consumer preference for organic and natural, food processors are fast trying to compensate this with maintaining taste and texture consistency.